Coloured glasses… a must or a no go? On my first day working at Bellissimo Weddings, I helped Melanie to style a very beautiful and romantic wedding in a marquee in Wimborne. I have to say that when she told me the glassware was all gold rimmed, I was more than a little dubious! I knew it was a very tasteful and pretty wedding but nonetheless I must admit the first thing that came into my head was ‘tacky’! But I am pleased to say I was proved wrong! Even after being shown the glasses, I was still not convinced but we laid the tables with them and all I can say is ‘Wow!’. They really transformed the styling of the marquee and made a world of difference. The bride had chosen a very pale colour scheme of blush pinks and creams – very beautiful but Melanie was concerned that with the ivory lining and ivory carpet, the space could looked a little washed out so suggested using gold rimmed glasses. She is known for usually being right, but this time she really did get it spot on! The gold rimmed glasses looked classy and elegant and complimented and enhanced the colour scheme the bride had chosen. Our Melanie is a big fan of coloured glasses, having chosen to have red wine glasses at her own wedding. Again, when she told me this I wasn’t sure what to think but when I looked at the photos, the red glasses looked amazing! I really am a convert to coloured glasses for table styling now. I think my fear was that it could look cheap and out of place but I have been shown that if it is done well it looks very classy and stylish and I now believe one of those finishing touches that are really worth it! Sticking to one colour (unless your colour scheme is multi-coloured) and getting good quality glasses are a must though! But be careful not to go too far. 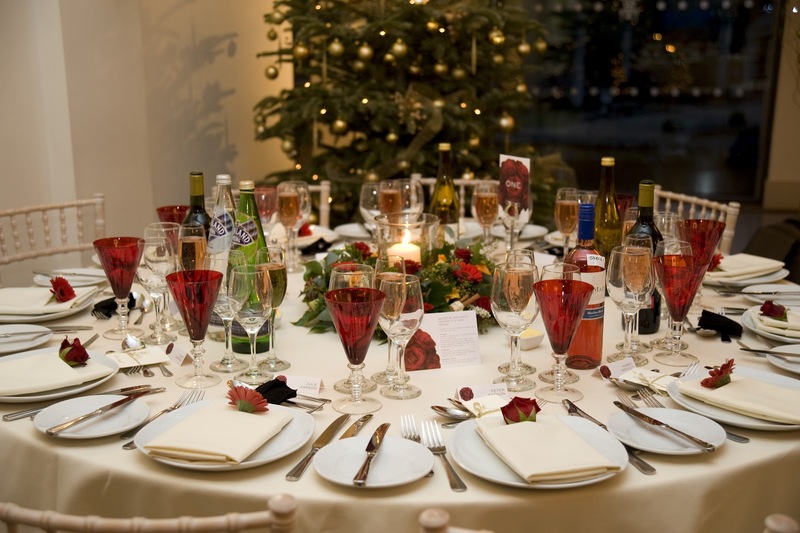 If you are laying the table with, a champagne flute ready for speeches, a white wine glass, a red wine glass and a water glass, my suggestion would be to choose one glass to have coloured and then keep the rest as plain clear glass. If you have all four as coloured glass, they could be too over powering, you just want an accent colour to run through the tables to create a real wow factor when your guests enter the marquee. On the other hand if you choose to use silver or gold rimmed glasses, you can up the anti a bit and go all out having all four or maybe three out of the four glasses with metallic rims. As they are not dense or bright colours, matching metallic rims can look better. A single metallic rimmed glass may look a little lost on its own, whilst three or four metallic rimmed glasses would not be over powering. The colour of these glasses is very subtle but match the colour of the napkins perfectly. Other than the glasses and the napkins, there isn’t much colour on the tables, meaning it doesn’t look too over the top. 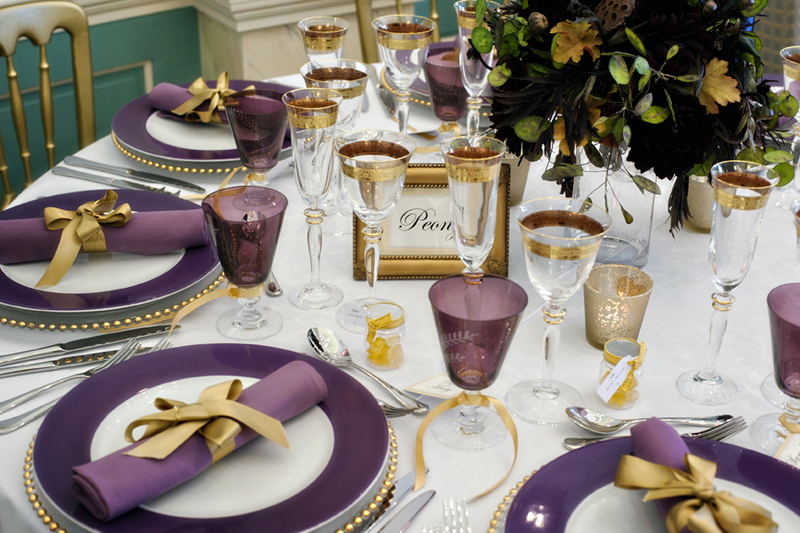 These glasses are just stunning, they add a bit of glamour to the table and match the silver charger plates to tie together the colour scheme. 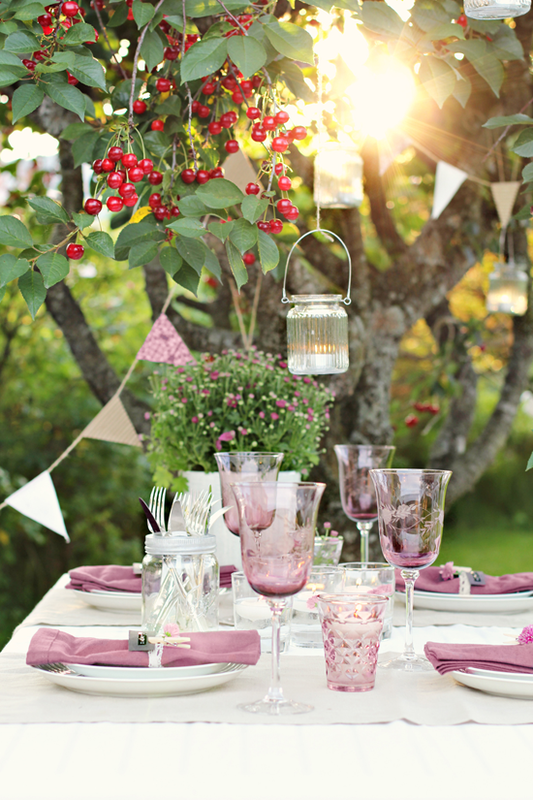 A very rustic look with different coloured glasses- it looks great but you have to get it right! The use of so many different colours could look a mess if you’re not careful but this scheme is bright but subdued so works well. Pretty in Pink! This design has just used coloured wine glasses which makes a statement. If they had chosen to use all pink glasses, it would have looked over the top. 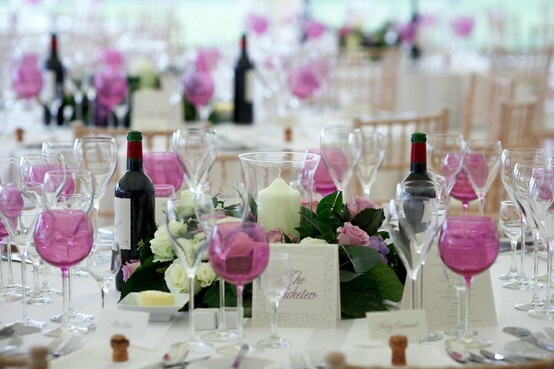 You can see pink glasses throughout the of the photo showing that having coloured glasses works really well to bring an accent into colour the dressing of your wedding. 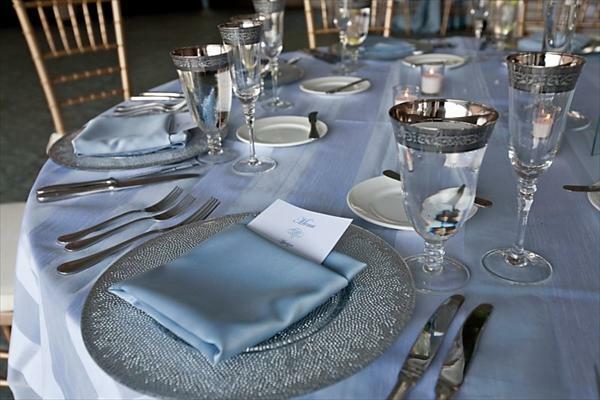 The blue glasses are pretty much the centre focus of this table dressing. Other that a couple of small vases of flowers, the glasses are all that they have used to dress it and what an impact it makes. 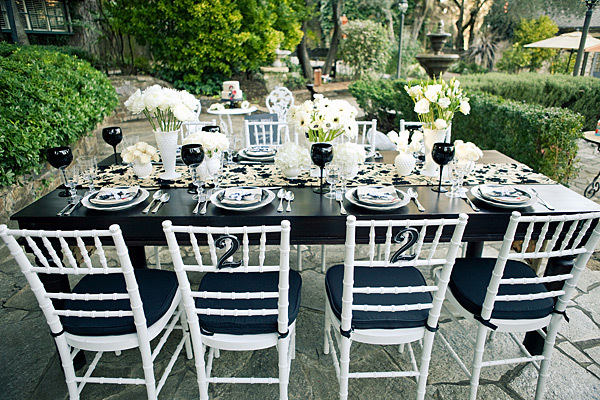 The glasses give a real wow factor and prove that you don’t need loads of items on your tables to dress them. 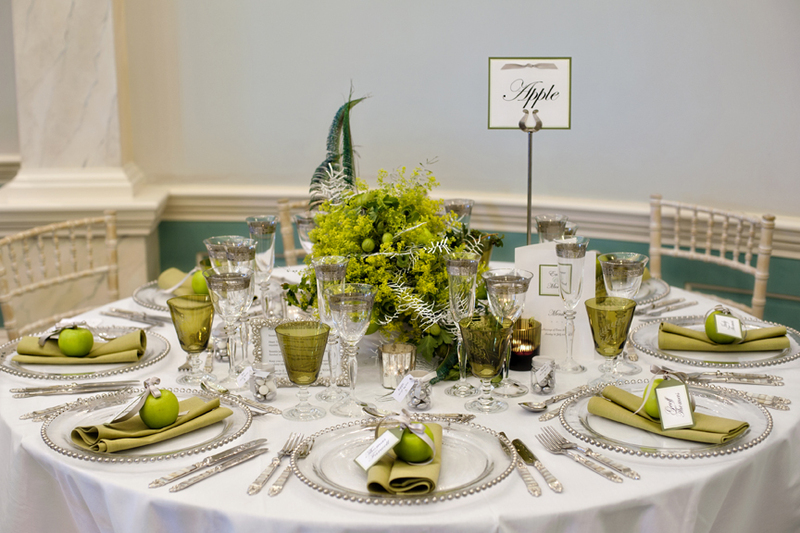 These images are from a wedding we planned and styled last year and the colour scheme was a collection of greens and again one single coloured glass at each place setting was used to really draw out the green accents throughout the colour scheme of the wedding. With just two colours running throughout this colour scheme, the coloured glasses emphasise the green among the taupe. Without the glasses, the green wouldn’t feel like part of the colour scheme and the whole room could have looked a little bland. 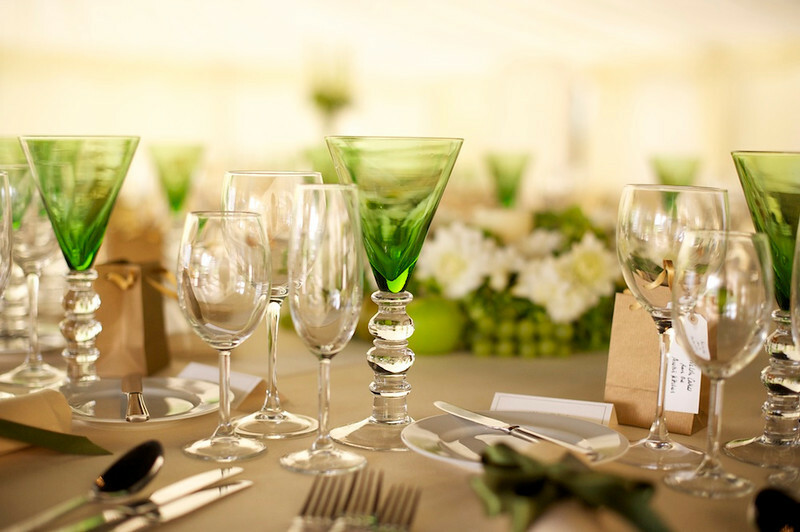 These fabulous green wine glasses also prove that the coloured glasses do not need to match the clear glasses in shape. 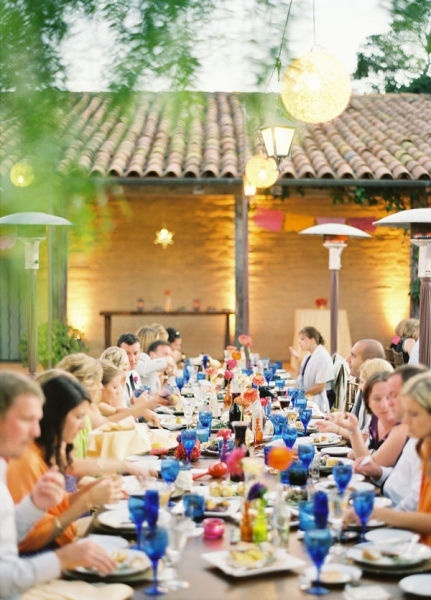 Being a different shape can add more interest to the tables. Coloured glasses are difficult to find to hire so finding coloured glasses to match the clear glasses in shape will be virtually impossible! This is very chic. It might not be considered to be a usual colour scheme for a wedding but this might make you think twice. The ivory and cream really soften the black. The black glasses really are the finishing touch to this table, clear glasses would have cluttered the theming. We were recently asked to help to style and dress the stunning 300 year old Grade II listed wedding venue Cams Hall for a Wedding Showcase day and we were asked to introduce some tables duly styled to suit the Oval Room to give brides an idea of how they could dress their own tables. The Aubergine and gold table is very luxurious whilst the apple table feels a little more rustic! Rather than filling the tables with lots of decorative bits and pieces, we used colour to add interest and the coloured glasses were a vital ingredient! What do you think? Have we converted you too?